The Head of the Presidential Council (PC), Fayez Al-Sirraj, has met with the European Union (EU) High Representative for Foreign Affairs, Federica Mogherini, to discuss security, illegal immigration, economic and other issues of mutual concern, the PC’s media office reported Tuesday. The meeting took place in Brussels, where Mogherini told Al-Sirraj that the EU fully supports his government in its efforts to consolidate the fight against illegal immigration. Mogherini also voiced support for the efforts aimed at political stability in Libya, the last of which Palermo Conference in Italy and UNSMIL’s Head plan to hold a National Conference by January next year. 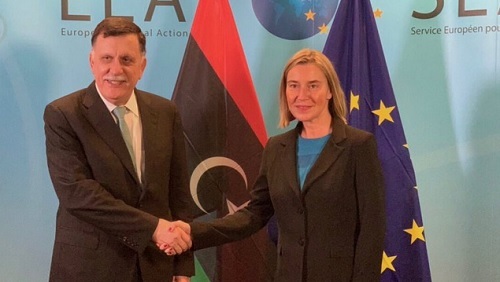 Al-Sirraj told Mogherini that he and his government are committed to elections based on a permanent constitution approved by Libyans, urging the EU to punish the hindering parties of the Libyan political process. He stressed also the need to activate the quadruple commission of UN, EU, African Union and Arab League, going also over his economic reforms that were approved in Line with the Central Bank and the UNSMIL. Al-Sirraj also talked about the quadruple agreement of Libya, Chad, Sudan and Niger in border protection, stressing the need for the EU’s support of that agreement, explains also that his government had sent a committee to resolve the issues in southern Libya.